Despite all the solid, readily available information on the passive voice, there remains a great deal of misinformation and confusion about it. This confusion, far from being limited to non-specialists, pervades professional circles too – journalists, for example, but also journalism professors and authors of writing manuals. A case in point is Essential English: For Journalists, Editors and Writers by Sir Harold Evans. First published as Newsman’s English in 1972, book one of a five-volume manual of newspaper writing and design, it was fully revised by Crawford Gillan and published by Pimlico in 2000, also incorporating book three, News Headlines (1974). 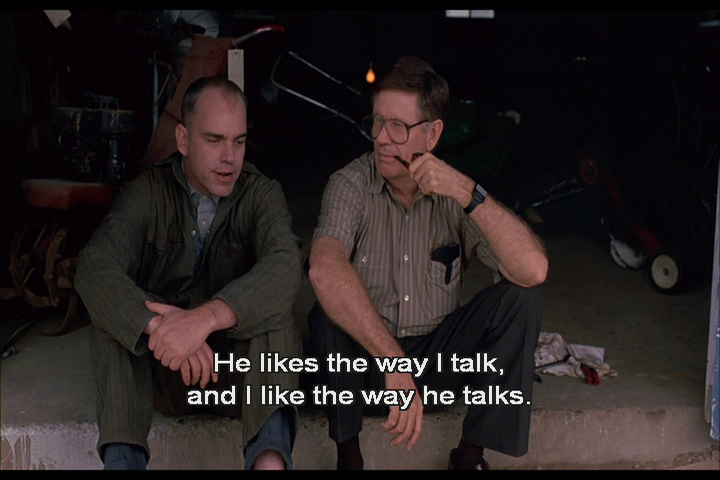 Last night I watched the film Sling Blade (1996) for the first time in years decades and liked it all over again. It has linguistic appeal too: the characters speak in strong dialects with idiomatic expressions. There are two items in particular I want to note here. The first is a moment of mild prescriptivism at a family table. What will the future of ‘like’ bilaik? The rise of quotative like (I was like, What?) has been swift and striking since it emerged a few decades ago. No word stays exactly the same, but the changes and extensions to like have been more noticeable than most on account of its versatility, popularity, and prominence. @LangMaverick friend's 4yo just asked "what's Ernie like?" After some offers of attributes etc we realized she meant "what's he saying"
If you click on Sarah’s first tweet (or its date, in some browsers) you can read more follow-up discussion. I would have been confused by what the child meant, and I’d probably have exhausted her patience long before figuring it out. The fact that Sarah Shulist is a linguistic anthropologist and Alexandra D’Arcy is a sociolinguist (who has done research on like) may have helped them infer the child’s intent more quickly in each case. Languages often borrow from one another: it’s a common source of linguistic growth and change. Normally what gets borrowed is words, called ‘loans’, ‘loanwords’, or ‘borrowings’ (though the terms suggest eventual return, which isn’t how it works). Any word that isn’t a loanword is a native word. English is a frequent borrower, being full of loanwords from many other languages. This ability to integrate foreign forms is one reason for its success. And it goes both ways: because of English’s status and reach, it’s a common ‘donor language’ for others. The World Loanword Database is a useful resource on the phenomenon. Less often, other linguistic elements are borrowed, like grammatical structures or pronunciations. An example of the former is because X, a popular construction in informal English. * I first wrote about because X in 2013, elsewhere picking it as my word of the year (the American Dialect Society later did likewise). Such was its impact that the phrase was discussed not just by linguists but by more mainstream outlets. 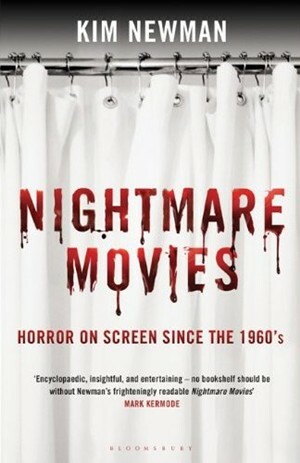 I’ve been stop-start-reading the revised edition of Kim Newman’s Nightmare Movies, a gift from my brother; it’s an encyclopaedic and thoroughly enjoyable account of Horror on Screen Since the 1960s, as the subtitle has it. There is no ghost, except the angry shade of Beethoven invoked by the unseen pianist’s stumbling attempts to get through Für Elise, but the Bramford [Rosemary’s apartment building] does have a Past. Ira Levin refined the parallel plot, a device that has been used in most subsequent haunted house films. While the protagonist is being overwhelmed by the supernatural forces clinging to his/her new home, he/she does a little detective work and pieces the place’s evil past together from newspaper morgues, friendly occultist know-alls, and ageing eyewitnesses. This use of his/her . . . he/she I found a bit halting and self-conscious. It took me out of the text, and not simply because I attend closely to pronoun use. Instead of conveying the author’s intent discreetly, it’s orthographically conspicuous enough to be distracting. Especially because it’s repeated: one instance might sneak by, but two is a pattern that draws unwanted attention. He/she and his/her are more equitable than generic he and his (which I see depressingly often), but they still give men precedence of position. S/he avoids this, but only by fragmenting she and leaving readers with something weird-looking and effectively unpronounceable. Simple reversals (she/he) are occasionally used, or the slash may be replaced by a conjunction: she or he, he or she. But there’s another problem. All of these options implicitly adopt a gender binary that excludes people who do not identify as either he or she (see my post on Mx). Writing manuals and style guides commonly note that he/she is awkward or clunky, particularly when repeated, but they seldom acknowledge its politics. One of the reasons I support singular they is that it circumvents this restrictive paradigm. The older I get the more unwieldy & exclusionary 'he or she' seems when we have singular 'they' available. It's natural, unfussy, inclusive. A great many people are unsure what the passive voice is, and what (if anything) is wrong with it. That wouldn’t be such a problem, except that a lot of those people misidentify and misrepresent the passive voice from positions of authority – whether they’re authors of writing manuals or journalists in need of a rhetorical scapegoat. Whenever someone complains about the passive voice, see if they're misidentifying or oversimplifying it. There's a very good chance of both. This is why you’ll often find writers deploring the passive while using it naturally in their own prose, blithely unaware of the double standard. For example, The Elements of Style says, ‘Use the active voice.’ But the first paragraph of E.B. White’s introduction to the book has five transitive verbs, four of which are (perfectly unobjectionable) passives. 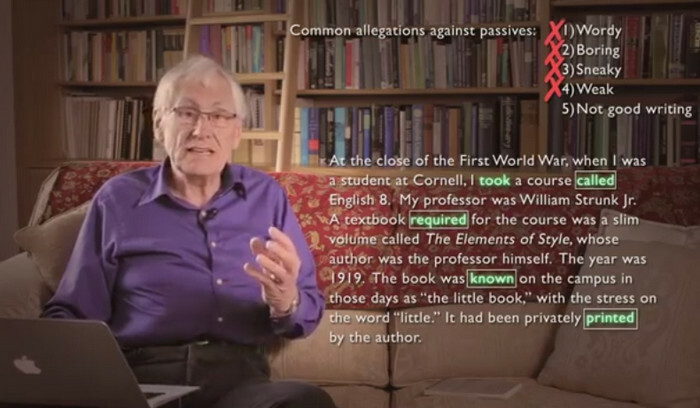 ‘Fear and Loathing of the English Passive’ is the name of a recent paper (PDF; HTML) by linguist Geoffrey Pullum on the passive voice. He has followed it with a series of six short videos on the topic (whence the image above). I’ve embedded them all below, for convenience. 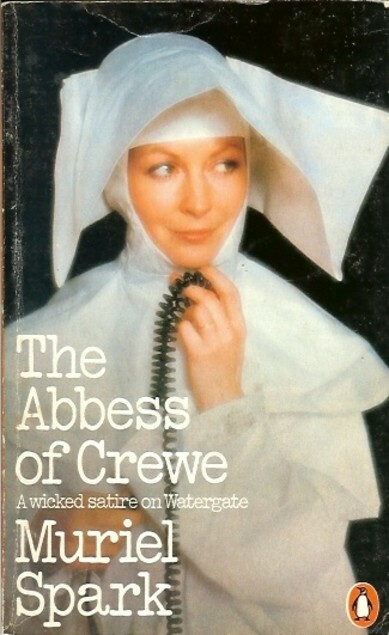 Chapter 3 of Muriel Spark’s witty novel The Abbess of Crewe (1974) begins with a lingering description of an object that proves centrally significant to the story unfolding in loose parallel to Watergate, the events of which Spark satirises. Felicity’s work-box is known as Felicity’s only because she brought it to the convent as part of her dowry. It is no mean box, being set on fine tapered legs with castors, standing two and a half feet high. The box is inlaid with mother-of-pearl and inside it has three tiers neatly set out with needles, scissors, cottons and silks in perfect compartments. Beneath all these is a false bottom lined with red watered silk, for love-letters. Many a time has Alexandra stood gazing at this box with that certain wonder of the aristocrat at the treasured toys of the bourgeoisie. ‘I fail to see what mitigation soever can be offered for that box,’ she remarked one day, in Felicity’s hearing, to the late Abbess Hildegarde who happened to be inspecting the sewing room. Hildegarde made no immediate reply, but once outside the room she said, ‘It is in poison-bad taste, but we are obliged by our vows to accept mortifications. And, after all, everything is hidden here. Nobody but ourselves can see what is beautiful and what is not.